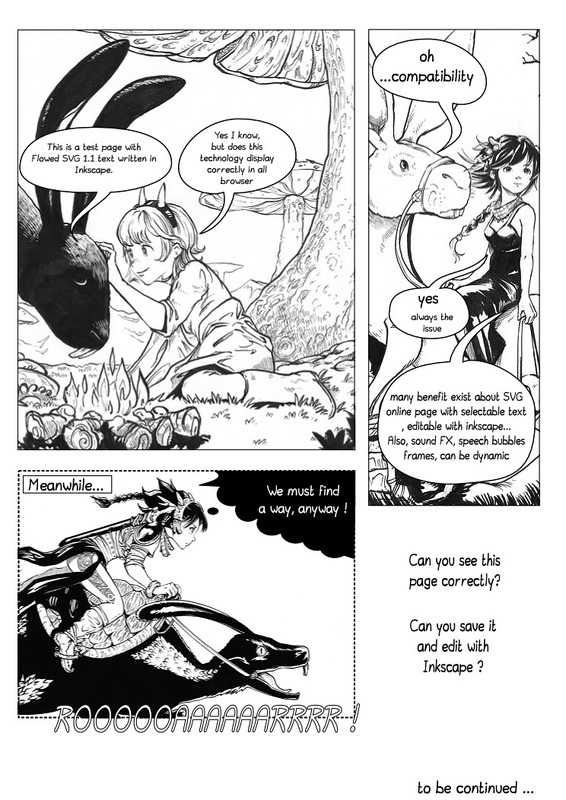 Update: This post was a technical experiment about online SVG , not a real webcomic page. User had the possibilities to give feedback , but that's not useful anymore: You can read the result and conclusion of the experimentation here . 1. Could you see this black and white fake comic page ? images and texts ? does it look exactly like this image ? 2. Can you save the first (SVG) image on your disk and edit it with the open-source vector program Inkscape ? Is it easy? Does it look similar? 3. Do you know how to use Git ? License: CC-BY David Revoy, www.davidrevoy.com, 12 november 2014 . 2. I can save it, but not open or edit it. Sorry, don't have Inkscape. @Zlata Medovaya, ru-translator : Hey Zlata :-) Thanks you for your test ! ( and also for sending the very first comment on Pepper&Carrot :-P ) . Ok, it means probably that I failed with the font. I can see it correctly here because I have the font http://www.dafont.com/lavi.font installed ... I'll do research to find a way to encapsule the font inside the SVG ( is it possible? ) , the same way PDF does. 1. I used 2 webbrowsers (Firefox and IE) both with Windows 8 and Windows 7 and the Lavi font not installed on the PC: I can see the images but not the Lavi font. With the Lavi font installed (Windows 8) the font is correct . SVG can embed fonts (http://www.w3.org/TR/SVG/fonts.html#SVGFontsOverview) but maybe Inkscape not. 2. I can save it and also edit it with Inkscape. 3. I never used it. I can do more testing if you want. The font here is being overwritten by website css. If you right-click on the image and select open image in a new tab the text appears as intended when you view it there. Keep in mind that if you are using a font that the person doesn't have installed on their computer it will only show the computers default font anyway. 2. Le fichier enregistré s'ouvre dans Inkscape (0.91 Mac) mais n'est pas éditable (bizarre)... alors qu'il l'est bien dans Illustrator CC 2014. 1) Je peux. Néanmoins, la police a été remplacée par du Comics Neue, qui est la police que j'ai sélectionné par défaut pour mon browser (Firefox). 2) Sans problème. Aussi aisé à télécharger et à ouvrir que s'il s'agissait d'une image .jpg ou .png. @Peter Moonen : Thank you for testing with the font installed and uninstalled and on Windows operating system. I cn't test Internet Explorer and it's good to know this browser display SVG. @Tom : Good to know. I'll do a future test with providing Lavi via CSS and hosting it. Maybe it's a solution for my hosting but it's not really portable. Or maybe I should just try to clean all the text ID to get unique ID and not collide with a CSS rule. Thanks for the advice about the font. @Frémo : Merci pour tes textes sur OSX ; c'est bizarre le problème de 'lecture seule' sur Inkscape ; je vais inspecter au cas ou c'est moi qui est buggé le fichier. @2000 : Ca confirme ce que Tom dit alors, le CSS local de chaque browser à son mot à dire sur le SVG. Ca va pas me faciliter la tache tout ça :) Pour Github , c'est un site de 'social coding' sur la base de GIT un controller de version non-linéaire. Bref, une plateforme pour entreposer du code, et le partager pour qu'il soit éditer simultanement par plusieurs personnes. Mais peut-être un peu dur dur à utiliser pour des non developpeurs. @Andrew : Thanks for the link, and for your feedback about your own research. Here I'm attracted by the easy 'editable text' aspect of the SVG. User can save the webcomic; and do direct change to the same file on his disk and republish. It should be that simple ; but it's not :) I'll keep working on it. 1. The font is not rendered correctly as it is missing from my system. but the images render perfectly. I have Identified that the Google Chrome doesn't support Svgs. So it appears as a Jpeg file. Then I tried it via Firefox, fortunately it supports SVG. It was downloaded and edited them in inkscape easily. I think it almost achieves your target. Because, only translators need to edit them. 1) All shapes are on their places, but fonts are missing and replaced by default. 2) No problem opening them with inkscape 0.48.4. But scenes looks like a raster images. Aren't they? Only text and its holders are vectorized objects. Yes, that's exact : images are still raster. The footprint of all of this graphics in pure vector would be very big (and creation in inkscape very tedious). Thanks for testing!